Patriot Games follows the adventures of outback experts and camping enthusiasts in a reality series. The savvy team will push the limits of the Patriot Campers, Stacer Boats and Supertourers in a gruelling Australian adventure. On their way to the far corners of Arnhem Land, Patriot Games takes their convoy to Willigi, an outpost in the Northern Territory. This vast area has less than one person every 6km and the team is thrilled to explore with their 349 Territory Strikers. The 349 Territory Striker was released early 2018, it is equipped with the Striker Hull that features wider chines creating more stability at rest and while underway. 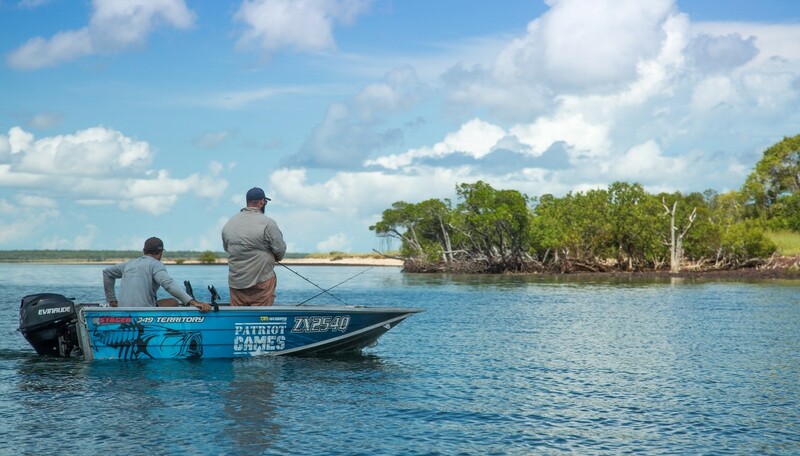 Justin and the team find the Stacer boats ideal for fishing and exploring the abundance of natural, untouched waters in Northern Australia. Deeper by 160mm and wider by 90mm, the 349 Territory Striker is designed for remote adventures in areas where high sides and more stability is important. Where the road ends and the water begins, the 349 Territory Striker is the perfect boat that can take Patriot Games adventures even further. A boat built with strong 1.6mm pressed aluminium sheets, it is light enough for two adults (or one adult and two little helpers) to lift on top of the vehicle. Patriot Games took advantage of Stacer’s options and added a carpeted low floor and casting platform. The 349 Territory Striker can also have a Bimini included, additional side rails and the bottom sheets can be upgraded to 2mm for those rough adventures. Patriot Games is made up of a down to earth family who is just happy to lend a hand. While in the distant Arnhem land, Justin, Sarah and the kids helps locals with various chores, heavy lifting and learn about life in the outback. ‘When Justin told me where they were going, I didn’t hesitate in recommending the 349 Territory Striker’ said Cameron Wood, National Account Manager for Stacer ‘This tinnie is a result customer feedback from passionate Northern Territory boaties; high sides, lightweight, rugged, it is the adventurers dream’.